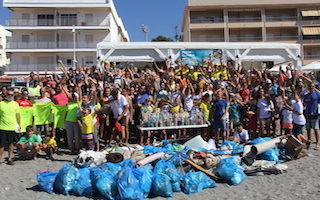 More than 350 people, including families and children, volunteered their time on Saturday, October the 6th to pick up plastic and other waste in La Herradura and Marina del Este. “I was overwhelmed with how many people came together for a common cause that impacts every person on the planet. As individuals, we can often feel that the plastic issue is just too big to handle on our own, but working together as a community is when we realise that we are all committed to figuring out how to keep our sea plastic free,” said Ann Jenkins, Organiser of Playa Patrol. It is obvious that cigarette butts and micro-plastics are one of the biggest threats to the sea. Fourteen teams spread throughout Marina del Este and La Herradura, collected 12kg or 24,000 cigarette butts in just under two hours. Teams also came across a wide variety of waste including abandoned boats, a ruined inflatable zodiac, a boat motor, rusted wheels, broken chairs, wood palettes, fishing nets and mesh, syringes, batteries, drinking straws, diapers, condoms, tampons and toilet paper. The volunteers delivered the collected garbage to the End Zone for a massive group photo and then helped carry it to the truck provided by Medio Ambiente. Antonio Matínez, Owner of Playa Mango, a new chiringuito in La Herradura, and his team, provided volunteers with a complimentary drink and tasty paella. Luis Arágon, Councillor of the Environment and First Councillor Juan Jose Ruiz Joya, were both in attendance at the event and had an opportunity to meet with many of the volunteers. Arágon handed out T-shirts as prizes to the children and provided free, reusable cigarette cups for adults to encourage proper disposal of cigarettes while on the beach. The next Community Clean Up will take place Saturday, November 17 and will be focused on Calaisa in La Herradura. This event is not suitable for children due to the rocky terrain. Playa Patrol is currently seeking 6 local fishermen to act as Team Captains. For more information, please visit Playa Patrol at https://www.facebook.com/groups/350823808792127/ or contact Ann Jenkins via What’s App at 690.773.507 or email her at Ann.PlayaPatrol@gmail.com. This entry was posted on Monday, October 8th, 2018 at 1:28 am	and is filed under La Herradura. You can follow any responses to this entry through the RSS 2.0 feed.